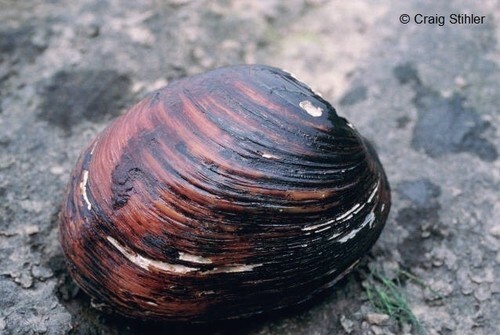 Freshwater mussels are one of the most imperiled freshwater animals. There are about 1,000 total known species of freshwater mussels with approximately 300 of those from North America. Alabama is the state with the greatest diversity of mussels with 181 species, 58 of those are endangered or threatened under the Endangered Species Act. Reasons for these declines include: water quality degradation (pollution), habitat destruction and alteration, damming and impoundment, exotic species, and, hydrologic changes, to name a few. 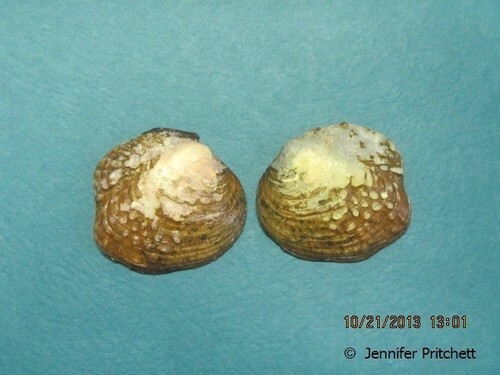 These large freshwater bivalves (2- to 30-cm) are the bottom dwellers of our freshwater rivers, streams, and lakes. Mussels are primarily suspension feeders, continually filtering water for phytoplankton from the water column. However, studies do suggest that mussels may feed on more than just algae, for instance: bacteria, detritus, protozoans, and zooplankton. 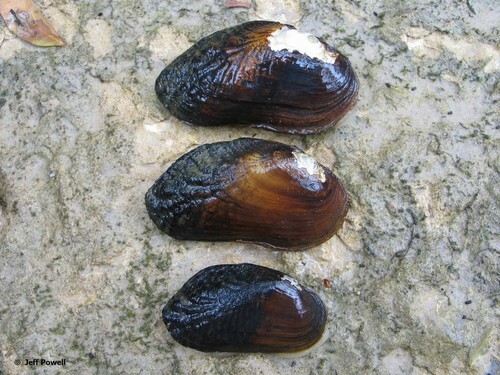 Freshwater mussels have a unique and bizarre life cycle that probably lends to the sensitivity of this faunal group to changes in the environment and its habitat. Mussels have a short but critical parasitic larval life stage that depends on the larval mussels (glochidia) attaching to the gills or fins of a proper fish hosts for a successful transition into an adult mussel. Mussels have developed many various adaptations (link to video or pics) to attract these hosts. After several weeks attached to the fish host, the now juvenile mussel drops from its host and begins it benthic existence. Mussels play an important role in our streams and river. Aside from the functional role they play in filtering water, sediment mixing, and particle processing. Mussels serve a role as bio-indicators to stream health. Canaries being especially sensitive to dangerous levels of methane or carbon monoxide gas were once used in coal mining as bio-indicators to acute levels of these gases, likewise, the presence of mussels bio-indicate a healthy stream ecosystem. 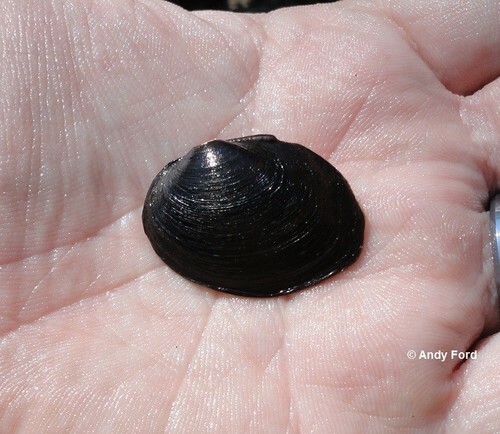 Streams that historically but no longer support freshwater mussels, may indicate degraded water After several weeks attached to the fish host, the now juvenile mussel drops from its host and begins it benthic existence. For more mussel life history click here! Fuzzy pigtoe Pleurobema strodeanum: The threatened fuzzy pigtoe is known from the Escambia, Yellow, and Choctawhatchee River drainages in coastal Alabama and Florida. This species lives in medium sized creeks to medium sized rivers in stable substrates of sand and silty sand with slow to moderate current. Pink mucket Lampsilis abrupta: This species of mussel lives in the Tennessee River drainage in mud and sand and in shallow riffles and shoals in major rivers and tributaries (streams that flow into mainstem rivers). The pink mucket is listed as endangered on the Endangered Species List. 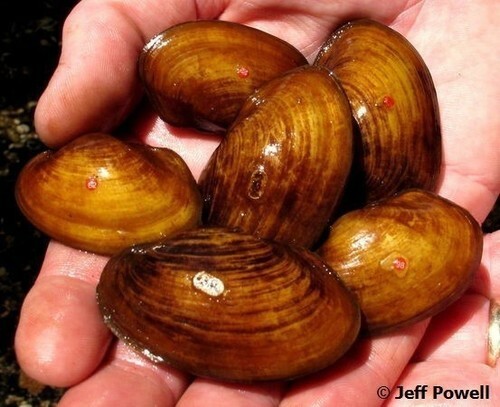 One of the major threats to this species are dams and reservoirs which change the flow of water and can block the mussel’s fish host from reaching it. Cumberland monkeyface Quadrula intermedia: The endangered Cumberland monkeyface can be found in the Tennessee River in Alabama in shallow shoals and riffles. This mussel and other monekyface mussels get their name from the shape of the shell; using your imagination you can see a monkey face on the back edge of the shell. Studies have shown that the streamline chub and the blotched chub are hosts for juvenile Cumberland monkeyface. Orangenacre mucket Hamiota perovalis: The orangenacre mucket is a rare mussel found in western Mobile Basin that is listed as threatened on the Endangered Species List. It is one of at least three species of mussel that produces superconglutinates which are cords tethered from the mussels gills that contain the juvenile mussles. The cord attracts the fish host because it looks like food and the juvenile mussels are released on the fish when it comes close.